This article is about the mind in a social setting. For other uses, see Social psychology (disambiguation). In psychology, social psychology is the scientific study of how people's thoughts, feelings, and behaviors are influenced by the actual, imagined, or implied presence of others. In this definition, scientific refers to the empirical method of investigation. The terms thoughts, feelings, and behaviors include all psychological variables that are measurable in a human being. The statement that others' presence may be imagined or implied suggests that we are prone to social influence even when no other people are present, such as when watching television, or following internalized cultural norms. Social psychologists typically explain human behavior as a result of the interaction of mental states and immediate social situations. Social psychologists therefore deal with the factors that lead us to behave in a given way in the presence of others, and look at the conditions under which certain behavior/actions and feelings occur. Social psychology is concerned with the way these feelings, thoughts, beliefs, intentions and goals are constructed and how such psychological factors, in turn, influence our interactions with others. Social psychology is a discipline that had traditionally bridged the gap between psychology and sociology. During the years immediately following World War II there was frequent collaboration between psychologists and sociologists. However, the two disciplines have become increasingly specialized and isolated from each other in recent years, with sociologists focusing on "macro variables" (e.g., social structure) to a much greater extent. Nevertheless, sociological approaches to social psychology remain an important counterpart to psychological research in this area. In addition to the split between psychology and sociology, there has been a somewhat less pronounced difference in emphasis between American social psychologists and European social psychologists. As a generalization, American researchers traditionally have focused more on the individual, whereas Europeans have paid more attention to group level phenomena (see group dynamics). Although there were some older treatises about social psychology, such as those by Islamic philosopher Al-Farabi (Alpharabius), the discipline of social psychology, as its modern-day definition, began in the United States at the dawn of the 20th century. However, the discipline had already developed a significant foundation. Following the 18th century, those in the emerging field of social psychology were concerned with developing concrete explanations for different aspects of human nature. They desired to discover concrete cause and effect relationships that explained the social interactions in the world around them. In order to do so, they believed that the scientific method, an empirically based scientific measure, could be applied to human behavior. The first published study in this area was an experiment in 1898 by Norman Triplett, on the phenomenon of social facilitation. During the 1930s, many Gestalt psychologists, most notably Kurt Lewin, fled to the United States from Nazi Germany. They were instrumental in developing the field as something separate from the behavioral and psychoanalytic schools that were dominant during that time, and social psychology has always maintained the legacy of their interests in perception and cognition. Attitudes and small group phenomena were the most commonly studied topics in this era. During World War II, social psychologists studied persuasion and propaganda for the U.S. military. After the war, researchers became interested in a variety of social problems, including gender issues and racial prejudice. Most notable, revealing, and contentious of these were the Stanley Milgram shock experiments on obedience to authority. In the sixties, there was growing interest in new topics, such as cognitive dissonance, bystander intervention, and aggression. By the 1970s, however, social psychology in America had reached a crisis. There was heated debate over the ethics of laboratory experimentation, whether or not attitudes really predicted behavior, and how much science could be done in a cultural context. This was also the time when a radical situationist approach challenged the relevance of self and personality in psychology. Social psychology reached a more mature level in both theories and methods during the 1980s and 1990s. Careful ethical standards now regulate research. Pluralistic and multicultural perspectives have emerged. Modern researchers are interested in many phenomena, but attribution, social cognition, and the self-concept are perhaps the greatest areas of growth in recent years. Social psychologists have also maintained their applied interests with contributions in health, environmental, and legal psychology. In social psychology, attitudes are defined as learned, global evaluations of a person, object, place, or issue that influence thought and action. Put more simply, attitudes are basic expressions of approval or disapproval, favorability or unfavorability, or as Bem put it, likes and dislikes. Examples would include liking chocolate ice cream, or endorsing the values of a particular political party. Social psychologists have studied attitude formation, the structure of attitudes, attitude change, the function of attitudes, and the relationship between attitudes and behavior. Because people are influenced by the situation, general attitudes are not always good predictors of specific behavior. For example, for a variety of reasons, a person may value the environment but not recycle a can on a particular day. In recent times, research on attitudes has examined the distinction between traditional, self-reported attitude measures and "implicit" or unconscious attitudes. For example, experiments using the Implicit Association Test have found that people often demonstrate implicit bias against other races, even when their explicit responses reveal equal mindedness. One study found that explicit attitudes correlate with verbal behavior in interracial interactions, whereas implicit attitudes correlate with nonverbal behavior. Attitudes are also involved in several other areas of the discipline, such as conformity, interpersonal attraction, social perception, and prejudice. The topic of persuasion has received a great deal of attention in recent years. Persuasion is an active method of influence that attempts to guide people toward the adoption of an attitude, idea, or behavior by rational or emotive means. Persuasion relies on "appeals" rather than strong pressure or coercion. Numerous variables have been found to influence the persuasion process; these are normally presented in five major categories: who said what to whom and how. The Communicator, including credibility, expertise, trustworthiness, and attractiveness. The Message, including varying degrees of reason, emotion (such as fear), one-sided or two sided arguments, and other types of informational content. The Audience, including a variety of demographics, personality traits, and preferences. The Channel or Medium, including the printed word, radio, television, the internet, or face-to-face interactions. The Context, including the environment, group dynamics, and preamble to the message. Dual-process theories of persuasion (such as the elaboration likelihood model) maintain that the persuasive process is mediated by two separate routes; central and peripheral. The central route of persuasion is more fact-based and results in longer lasting change, but requires motivation to process. The peripheral route is more superficial and results in shorter lasting change, but does not require as much motivation to process. An example of a peripheral route of persuasion might be a politician using a flag lapel pin, smiling, and wearing a crisp, clean shirt. Notice that this does not require motivation to be persuasive, but should not last as long as persuasion based on the central route. If that politician were to outline exactly what they believed, and their previous voting record, this would be using the central route, and would result in longer lasting change, but would require a good deal of motivation to process. Social cognition is a growing area of social psychology that studies how people perceive, think about, and remember information about others. Much research rests on the assertion that people think about (other) people differently from non-social targets. This assertion is supported by the social cognitive deficits exhibited by people with Williams syndrome and autism. Person perception is the study of how people form impressions of others. The study of how people form beliefs about each other while interacting is known as interpersonal perception. A major research topic in social cognition is attribution. Attributions are the explanations we make for people's behavior, either our own behavior or the behavior of others. We can ascribe the locus of a behavior to either internal or external factors. An internal, or dispositional, attribution assigns behavior to causes related to inner traits such as personality, disposition, character or ability. An external, or situational, attribution involves situational elements, such as the weather. :111 A second element, attribution, ascribes the cause of behavior to either stable or unstable factors (whether the behavior will be repeated or changed under similar circumstances). Finally, we also attribute causes of behavior to either controllable or uncontrollable factors : how much control one has over the situation at hand. Numerous biases in the attribution process have been discovered. For instance, the fundamental attribution error is the tendency to make dispositional attributions for behavior, overestimating the influence of personality and underestimating the influence of situations. :724 The actor-observer difference is a refinement of this bias, the tendency to make dispositional attributions for other people's behavior and situational attributions for our own. :107 The self-serving bias is the tendency to attribute dispositional causes for successes, and situational causes for failure, particularly when self-esteem is threatened. This leads to assuming one's successes are from innate traits, and one's failures are due to situations, including other people. :109 Other ways people protect their self-esteem are by believing in a just world, blaming victims for their suffering, and making defensive attributions, which explain our behavior in ways which defend us from feelings of vulnerability and mortality. :111 Researchers have found that mildly depressed individuals often lack this bias and actually have more realistic perceptions of reality (as measured by the opinions of others). Heuristics are cognitive short cuts. Instead of weighing all the evidence when making a decision, people rely on heuristics to save time and energy. The availability heuristic occurs when people estimate the probability of an outcome based on how easy that outcome is to imagine. As such, vivid or highly memorable possibilities will be perceived as more likely than those that are harder to picture or are difficult to understand, resulting in a corresponding cognitive bias. The representativeness heuristic is a shortcut people use to categorize something based on how similar it is to a prototype they know of. :63 Numerous other biases have been found by social cognition researchers. The hindsight bias is a false memory of having predicted events, or an exaggeration of actual predictions, after becoming aware of the outcome. The confirmation bias is a type of bias leading to the tendency to search for, or interpret information in a way that confirms one's preconceptions. Another key concept in social cognition is the assumption that reality is too complex to easily discern. As a result, we tend to see the world according to simplified schemas or images of reality. Schemas are generalized mental representations that organize knowledge and guide information processing. Schemas often operate automatically and unintentionally, and can lead to biases in perception and memory. Expectations from schemas may lead us to see something that is not there. One experiment found that people are more likely to misperceive a weapon in the hands of a black man than a white man. This type of schema is actually a stereotype, a generalized set of beliefs about a particular group of people (when incorrect, an ultimate attribution error). Stereotypes are often related to negative or preferential attitudes (prejudice) and behavior (discrimination). Schemas for behaviors (e.g., going to a restaurant, doing laundry) are known as scripts. Self-concept is a term referring to the whole sum of beliefs that people have about themselves. However, what specifically does self-concept consist of? According to Hazel Markus (1977), the self-concept is made up of cognitive molecules called self-schemas – beliefs that people have about themselves that guide the processing of self-reliant information. For example, an athlete at a university would have multiple selves that would process different information pertinent to each self: the student would be one "self," who would process information pertinent to a student (taking notes in class, completing a homework assignment, etc. ); the athlete would be the "self" who processes information about things related to being an athlete (recognizing an incoming pass, aiming a shot, etc.). These "selves" are part of one's identity and the self-reliant information is the information that relies on the proper "self" to process and react on it. If a "self" is not part of one's identity, then it is much more difficult for one to react. For example, a civilian may not know how to handle a hostile threat as a trained Marine would. The Marine contains a "self" that would enable him/her to process the information about the hostile threat and react accordingly, whereas a civilian may not contain that self, disabling them from properly processing the information from the hostile threat and, furthermore, debilitating them from acting accordingly. Self-schemas are to an individual’s total self–concept as a hypothesis is to a theory, or a book is to a library. A good example is the body weight self-schema; people who regard themselves as over or underweight, or for those whom body image is a significant self-concept aspect, are considered schematics with respect to weight. For these people a range of otherwise mundane events – grocery shopping, new clothes, eating out, or going to the beach – can trigger thoughts about the self. In contrast, people who do not regard their weight as an important part of their lives are a-schematic on that attribute. It is rather clear that the self is a special object of our attention. Whether one is mentally focused on a memory, a conversation, a foul smell, the song that is stuck in one's head, or this sentence, consciousness is like a spotlight. This spotlight can shine on only one object at a time, but it can switch rapidly from one object to another and process the information out of awareness. In this spotlight the self is front and center: things relating to the self have the spotlight more often. Affective forecasting is the process of predicting how one would feel in response to future emotional events. Studies done by Timothy Wilson and Daniel Gilbert in 2003 have shown that people overestimate the strength of reaction to anticipated positive and negative life events that they actually feel when the event does occur. The fields of social psychology and personality have merged over the years, and social psychologists have developed an interest in self-related phenomena. In contrast with traditional personality theory, however, social psychologists place a greater emphasis on cognitions than on traits. Much research focuses on the self-concept, which is a person's understanding of his or her self. The self-concept is often divided into a cognitive component, known as the self-schema, and an evaluative component, the self-esteem. The need to maintain a healthy self-esteem is recognized as a central human motivation in the field of social psychology. Self-efficacy beliefs are associated with the self-schema. These are expectations that performance on some task will be effective and successful. Social psychologists also study such self-related processes as self-control and self-presentation. People develop their self-concepts by varied means, including introspection, feedback from others, self-perception, and social comparison. By comparison to relevant others, people gain information about themselves, and they make inferences that are relevant to self-esteem. Social comparisons can be either "upward" or "downward," that is, comparisons to people who are either higher in status or ability, or lower in status or ability. Downward comparisons are often made in order to elevate self-esteem. Self-perception is a specialized form of attribution that involves making inferences about oneself after observing one's own behavior. Psychologists have found that too many extrinsic rewards (e.g. money) tend to reduce intrinsic motivation through the self-perception process, a phenomenon known as overjustification. People's attention is directed to the reward and they lose interest in the task when the reward is no longer offered. This is an important exception to reinforcement theory. Social influence is an overarching term given to describe the persuasive effects people have on each other. It is seen as a fundamental value in social psychology and overlaps considerably with research on attitudes and persuasion. The three main areas of social influence include: conformity, compliance, and obedience. Social influence is also closely related to the study of group dynamics, as most principles of influence are strongest when they take place in social groups. 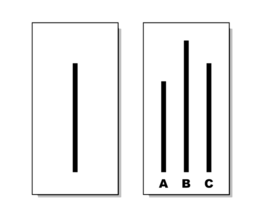 Which line matches the first line, A, B, or C? In the Asch conformity experiments, people frequently followed the majority judgment, even when the majority was (objectively) wrong. The second major area of social influence research is compliance. Compliance refers to any change in behavior that is due to a request or suggestion from another person. The foot-in-the-door technique is a compliance method in which the persuader requests a small favor and then follows up with requesting a larger favor, e.g., asking for the time and then asking for ten dollars. A related trick is the bait and switch. Norms: Implicit rules and expectations for group members to follow, e.g. saying thank you, shaking hands. Roles: Implicit rules and expectations for specific members within the group, e.g. the oldest sibling, who may have additional responsibilities in the family. Relations: Patterns of liking within the group, and also differences in prestige or status, e.g., leaders, popular people. Temporary groups and aggregates share few or none of these features, and do not qualify as true social groups. People waiting in line to get on a bus, for example, do not constitute a group. Groups are important not only because they offer social support, resources, and a feeling of belonging, but because they supplement an individual's self-concept. To a large extent, humans define themselves by the group memberships which form their social identity. The shared social identity of individuals within a group influences intergroup behavior, the way in which groups behave towards and perceive each other. These perceptions and behaviors in turn define the social identity of individuals within the interacting groups. The tendency to define oneself by membership in a group may lead to intergroup discrimination, which involves favorable perceptions and behaviors directed towards the in-group, but negative perceptions and behaviors directed towards the out-group. On the other hand, such discrimination and segregation may sometimes exist partly to facilitate a diversity which strengthens society. Intergroup discrimination leads to prejudice and stereotyping, while the processes of social facilitation and group polarization encourage extreme behaviors towards the out-group. Groups often moderate and improve decision making, and are frequently relied upon for these benefits, such as in committees and juries. A number of group biases, however, can interfere with effective decision making. For example, group polarization, formerly known as the "risky shift," occurs when people polarize their views in a more extreme direction after group discussion. More problematic is the phenomenon of groupthink. This is a collective thinking defect that is characterized by a premature consensus or an incorrect assumption of consensus, caused by members of a group failing to promote views which are not consistent with the views of other members. Groupthink occurs in a variety of situations, including isolation of a group and the presence of a highly directive leader. Janis offered the 1961 Bay of Pigs Invasion as a historical case of groupthink. Groups also affect performance and productivity. Social facilitation, for example, is a tendency to work harder and faster in the presence of others. Social facilitation increases the dominant response's likelihood, which tends to improve performance on simple tasks and reduce it on complex tasks. In contrast, social loafing is the tendency of individuals to slack off when working in a group. Social loafing is common when the task is considered unimportant and individual contributions are not easy to see. Social psychologists study group-related (collective) phenomena such as the behavior of crowds. An important concept in this area is deindividuation, a reduced state of self-awareness that can be caused by feelings of anonymity. Deindividuation is associated with uninhibited and sometimes dangerous behavior. It is common in crowds and mobs, but it can also be caused by a disguise, a uniform, alcohol, dark environments, or online anonymity. Social psychologists study interactions within groups, and between both groups and individuals. A major area in the study of people's relations to each other is interpersonal attraction. This refers to all forces that lead people to like each other, establish relationships, and (in some cases) fall in love. Several general principles of attraction have been discovered by social psychologists, but many still continue to experiment and do research to find out more. One of the most important factors in interpersonal attraction is how similar two particular people are. The more similar two people are in general attitudes, backgrounds, environments, worldviews, and other traits, the more probable an attraction is possible. Physical attractiveness is an important element of romantic relationships, particularly in the early stages characterized by high levels of passion. Later on, similarity and other compatibility factors become more important, and the type of love people experience shifts from passionate to companionate. Robert Sternberg has suggested that there are actually three components of love: intimacy, passion, and commitment. When two (or more) people experience all three, they are said to be in a state of consummate love. According to social exchange theory, relationships are based on rational choice and cost-benefit analysis. If one partner's costs begin to outweigh his or her benefits, that person may leave the relationship, especially if there are good alternatives available. This theory is similar to the minimax principle proposed by mathematicians and economists (despite the fact that human relationships are not zero-sum games). With time, long term relationships tend to become communal rather than simply based on exchange. Social psychology is an empirical science that attempts to answer questions about human behavior by testing hypotheses, both in the laboratory and in the field. Careful attention to sampling, research design, and statistical analysis is important; results are published in peer reviewed journals such as the Journal of Experimental Social Psychology, Personality and Social Psychology Bulletin and the Journal of Personality and Social Psychology. Social psychology studies also appear in general science journals such as Psychological Science and Science. Experimental methods involve the researcher altering a variable in the environment and measuring the effect on another variable. An example would be allowing two groups of children to play violent or nonviolent videogames, and then observing their subsequent level of aggression during free-play period. A valid experiment is controlled and uses random assignment. Correlational methods examine the statistical association between two naturally occurring variables. For example, one could correlate the amount of violent television children watch at home with the number of violent incidents the children participate in at school. Note that this study would not prove that violent TV causes aggression in children: it is quite possible that aggressive children choose to watch more violent TV. Observational methods are purely descriptive and include naturalistic observation, "contrived" observation, participant observation, and archival analysis. These are less common in social psychology but are sometimes used when first investigating a phenomenon. An example would be to unobtrusively observe children on a playground (with a videocamera, perhaps) and record the number and types of aggressive actions displayed. Whenever possible, social psychologists rely on controlled experimentation. Controlled experiments require the manipulation of one or more independent variables in order to examine the effect on a dependent variable. Experiments are useful in social psychology because they are high in internal validity, meaning that they are free from the influence of confounding or extraneous variables, and so are more likely to accurately indicate a causal relationship. However, the small samples used in controlled experiments are typically low in external validity, or the degree to which the results can be generalized to the larger population. There is usually a trade-off between experimental control (internal validity) and being able to generalize to the population (external validity). Because it is usually impossible to test everyone, research tends to be conducted on a sample of persons from the wider population. Social psychologists frequently use survey research when they are interested in results that are high in external validity. Surveys use various forms of random sampling to obtain a sample of respondents that are representative of a population. This type of research is usually descriptive or correlational because there is no experimental control over variables. However, new statistical methods like structural equation modeling are being used to test for potential causal relationships in this type of data. Regardless of which method is used, it is important to evaluate the research hypothesis using the results, either confirming or rejecting the original prediction. Social psychologists use statistics and probability testing to judge their results; these define a significant finding as less than 5% likely to be due to chance. Replications are important, to ensure that the result is valid and not due to chance, or some feature of a particular sample. False positive conclusions, often resulting from the pressure to publish or the author's own confirmation bias, are a hazard in the field. The goal of social psychology is to understand cognition and behavior as they naturally occur in a social context, but the very act of observing people can influence and alter their behavior. For this reason, many social psychology experiments utilize deception to conceal or distort certain aspects of the study. Deception may include false cover stories, false participants (known as confederates or stooges), false feedback given to the participants, and so on. The practice of deception has been challenged by some psychologists who maintain that deception under any circumstances is unethical, and that other research strategies (e.g., role-playing) should be used instead. Unfortunately, research has shown that role-playing studies do not produce the same results as deception studies and this has cast doubt on their validity. In addition to deception, experimenters have at times put people into potentially uncomfortable or embarrassing situations (e.g., the Milgram experiment and Stanford prison experiment), and this has also been criticized for ethical reasons. To protect the rights and well-being of research participants, and at the same time discover meaningful results and insights into human behavior, virtually all social psychology research must pass an ethical review process. At most colleges and universities, this is conducted by an ethics committee or Institutional Review Board. This group examines the proposed research to make sure that no harm is likely to be done to the participants, and that the study's benefits outweigh any possible risks or discomforts to people taking part in the study. Furthermore, a process of informed consent is often used to make sure that volunteers know what will happen in the experiment and understand that they are allowed to quit the experiment at any time. A debriefing is typically done at the experiment's conclusion in order to reveal any deceptions used and generally make sure that the participants are unharmed by the procedures. Today, most research in social psychology involves no more risk of harm than can be expected from routine psychological testing or normal daily activities. Social psychology has recently found itself at the center of a "replication crisis" due to some research findings proving difficult to replicate. Replication failures are not unique to social psychology and are found in all fields of science. However, several factors have combined to put social psychology at the center of the current controversy. Firstly, questionable research practices (QRP) have been identified as common in the field. Such practices, while not necessarily intentionally fraudulent, involve converting undesired statistical outcomes into desired outcomes via the manipulation of statistical analyses, sample size or data management, typically to convert non-significant findings into significant ones. Some studies have suggested that at least mild versions of QRP are highly prevalent. One of the critics of Daryl Bem in the feeling the future controversy has suggested that the evidence for precognition in this study could (at least in part) be attributed to QRP. Secondly, social psychology has found itself at the center of several recent scandals involving outright fraudulent research. Most notably the admitted data fabrication by Diederik Stapel as well as allegations against others. However, most scholars acknowledge that fraud is, perhaps, the lesser contribution to replication crises . Third, several effects in social psychology have been found to be difficult to replicate even before the current replication crisis. For example, the scientific journal Judgment and Decision Making has published several studies over the years that fail to provide support for the unconscious thought theory. Replications appear particularly difficult when research trials are pre-registered and conducted by research groups not highly invested in the theory under questioning. 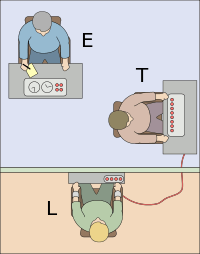 The Milgram experiment: The experimenter (E) persuades the participant (T) to give what the participant believes are painful electric shocks to another participant (L), who is actually an actor. Many participants continued to give shocks despite pleas for mercy from the actor. The Asch conformity experiments demonstrated the power of conformity in small groups with a line estimation task that was designed to be extremely easy. On over a third of the trials, participants conformed to the majority, even though the majority judgment was clearly wrong. Seventy-five percent of the participants conformed at least once during the experiment. Muzafer Sherif's Robbers' Cave Experiment divided boys into two competing groups to explore how much hostility and aggression would emerge. Sherif's explanation of the results became known as realistic group conflict theory, because the intergroup conflict was induced through competition over resources. Inducing cooperation and superordinate goals later reversed this effect. In Leon Festinger's cognitive dissonance experiment, participants were asked to perform a boring task. They were divided into 2 groups and given two different pay scales. At the study's end, some participants were paid $1 to say that they enjoyed the task and another group of participants was paid $20 to say the same lie. The first group ($1) later reported liking the task better than the second group ($20). Festinger's explanation was that for people in the first group being paid only $1 is not sufficient incentive for lying and those who were paid $1 experienced dissonance. They could only overcome that dissonance by justifying their lies by changing their previously unfavorable attitudes about the task. Being paid $20 provides a reason for the doing the boring task, therefore no dissonance. One of the most notable experiments in social psychology was the Milgram experiment, which studied how far people would go to obey an authority figure. Following the events of The Holocaust in World War II, the experiment showed that (most) normal American citizens were capable of following orders from an authority even when they believed they were causing an innocent person to suffer. Albert Bandura's Bobo doll experiment demonstrated how aggression is learned by imitation. This set of studies fueled debates regarding media violence which continue to be waged among scholars. In the Stanford prison study, by Philip Zimbardo, a simulated exercise between student prisoners and guards showed how far people would follow an adopted role. In just a few days, the "guards" became brutal and cruel, and the prisoners became miserable and compliant. This was initially argued to be an important demonstration of the power of the immediate social situation and its capacity to overwhelm normal personality traits. However, to this day, it remains a matter of contention what conclusions may be drawn from this study. For example, it has been pointed out that participant self-selection may have affected the participants' behaviour, and that the participants' personality influenced their reactions in a variety of ways, including how long they chose to remain in the study. One of the most concerted empirical revisitations of the themes raised by Zimbardo came with the 2002 BBC prison study. ↑ Sewell, W. H (1989). "Some reflections on the golden age of interdisciplinary social psychology". Annual Review of Sociology. 15: 1–17. doi:10.1146/annurev.so.15.080189.000245. ↑ Moscovici, S; Markova, I (2006). The Making of Modern Social Psychology. Cambridge, UK: Polity Press. ↑ Gergen, K. J. (1973). "Social Psychology as History". Journal of Personality and Social Psychology. 26: 309–320. doi:10.1037/h0034436. ↑ Triplett, Norman (1898). "The dynamogenic factors in pacemaking and competition". American Journal of Psychology. 9 (4): 507–533. doi:10.2307/1412188. ↑ Gergen, Kenneth J (1973). "Social psychology as history". Journal of Personality and Social Psychology. 26 (2): 309–320. doi:10.1037/h0034436. ↑ Sison, Erick Louie. A (2008). The dynamics of persuasion. New York: Lawrence Erlbaum. ↑ Bem, D (1970). Beliefs, attitudes, and human affairs. Belmont, CA: Brooks/Cole. ↑ Heider, J. D; Skowronski, J. J (2007). "Improving the Predictive Validity of the Implicit Association Test". North American Journal of Psychology. 9: 53–76. 1 2 3 Kassin, Saul; Fein, Steven; Markus, Hazel Rose (2008). Social Psychology (7 ed.). Boston, NY: Houghton Mifflin Company. ISBN 0-618-86846-1. ↑ Myers, David (2010). Social Psychology, Tenth Edition. New York: McGraw-Hill. pp. 234–253. ISBN 978-0-07-337066-8. ↑ Moskowitz, Gordon B (2005). Social Cognition: Understanding Self and Others. Texts in Social Psychology. Guilford. ISBN 978-1-59385-085-2. ↑ Dobbs, Davis (8 July 2007). "The Gregarious Brain". The New York Times. ↑ Reisenzein, Rainer; Rudolph, Udo (2008). "50 Years of Attribution Research". Social Psychology. 39 (3): 123–124. doi:10.1027/1864-9335.39.3.123. ISSN 1864-9335. 1 2 3 4 5 6 Aronson, Elliot; Wilson, Timothy D; Akert, Robin M (2010). Social Psychology (7 ed.). Prentice Hall. ↑ David G. Myers (2007). Psychology (8 ed.). Worth. ↑ Andrews, Paul (August 2000). "The psychology of social chess and the evolution of attributional mechanisms: explaining the fundamental attribution error" (PDF). Elsevier. 11 (20). Retrieved 29 February 2012. ↑ Correll, Joshua; Park, Bernadette; Judd, Charles M; Wittenbrink, Bernd (2002). "The police officer's dilemma: Using ethnicity to disambiguate potentially threatening individuals". Journal of Personality and Social Psychology. 83 (6): 1,314–1,329. doi:10.1037/0022-3514.83.6.1314. ISSN 0022-3514. ↑ Markus, Hazel (1977). "Self-Schemata and Processing Information". Journal of Personality and Social Psychology. 35: 63–78. doi:10.1037/0022-3514.35.2.63. ↑ Wilson, Timothy D; Gilbert, Daniel T (2003). "Affective Forecasting". Advances in Experimental Psychology (35): 345–411. ↑ Bem, Daryl J (1972). "Self Perception Theory". Advances in Experimental Social Psychology. Advances in Experimental Social Psychology. 6: 1–62. doi:10.1016/S0065-2601(08)60024-6. ISBN 978-0-12-015206-3. ↑ Festinger, Leon (1954). "A theory of social comparison process". Human Relations. 7 (2): 117–140. doi:10.1177/001872675400700202. ↑ Deci, E. L; Koestner, R; Ryan, R. M (2001). "Extrinsic rewards and intrinsic motivation in education: Reconsidered once again". 71: 1–27. 1 2 3 Aronson, Elliot (2008). The Social Animal (10 ed.). Worth. ↑ Cialdini, R.B (2000). Influence: Science and Practice. Allyn and Bacon. ↑ Forsyth, D.R (2006). Group dynamics. Belmont, CA: Thomson-Wadworth. ↑ Tajfel, H; Turner, J.C (1986). "The social identity theory of intergroup behavior". In Worchel, S; Austin, W.G. Psychology of Intergroup Relations. Chicago, Illinois: Nelson-Hall. ↑ Haidt, Jonathan; Rosenberg, Evan; Hom, Holly (2003). "Differentiating Diversities: Moral Diversity Is Not Like Other Kinds". Journal of Applied Social Psychology. 33 (1): 1–36. doi:10.1111/j.1559-1816.2003.tb02071.x. ↑ Janis, I.L (1972). Victims of Groupthink. Boston, Massachusetts: Houghton Mifflin. ↑ PsyBlog, "Social Loafing: when groups are bad for productivity," 19 May 2009. ↑ In the online domain, e.g., see Rosen, L. D., Cheever, N. A., & Carrier, L. M. (2015) The Wiley Handbook of Psychology, Technology and Society. Oxford: Wiley Blackwell. ↑ Byrne, D. (1961). Journal of Abnormal and Social Psychology. 62. pp. 713–715. "Thus Interpersonal attraction and attitude similarity have a direct correlation. More so than those with dissimilar attitudes and views, who tend to not be as successful in the attraction department." ↑ Sternberg, Robert J (1986). "A Triangular Theory of Love". Psychological Review. 93 (2): 119–135. doi:10.1037/0033-295X.93.2.119. 1 2 Simmons, Joseph; Nelson, Leif; Simonsohn, Uri (November 2011). "False-Positive Psychology: Undisclosed Flexibility in Data Collection and Analysis Allows Presenting Anything as Significant". Psychological Science. Washington DC: Association for Psychological Science. 22 (11): 1359–1366. doi:10.1177/0956797611417632. ISSN 0956-7976. PMID 22006061. Retrieved 29 January 2012. ↑ "Questionable Research Practices Surprisingly Common"
↑ "Fraud Scandal Fuels Debate Over Practices of Social Psychology: Even legitimate researchers cut corners, some admit"
↑ "Psychology’s replication drive: it’s not about you"
↑ Asch, S.E (1955). "Opinions and social pressure". Scientific American: 31–35. ↑ Sherif, Muzafer (1954). "Experiments in group conflict". Scientific American. 195: 54–58. doi:10.1038/scientificamerican1156-54. ↑ Festinger, Leon; Carlsmith, J.M (1959). "Cognitive consequences of forced compliance". Journal of Abnormal and Social Psychology. 58 (2): 203–211. doi:10.1037/h00415b86. ↑ Milgram, Stanley (1975). Obedience to authority. Harper and Bros.
↑ Bandura, Albert; Ross, D; Ross, S.A (1961). "Transmission of aggression through imitation of aggressive models". Journal of Abnormal and Social Psychology. 63 (3): 575–582. doi:10.1037/h0045925. PMID 13864605. ↑ Haney, C; Banks, W.C; Zimbardo, Philip G (1973). "Interpersonal dynamics in a simulated prison". International Journal of Criminology and Penology. 1: 69–97. ↑ Carnahan, Thomas; McFarland, Sam (2007). "Revisiting the Stanford prison experiment: Could participant self-selection have led to the cruelty?" (PDF). Personality and Social Psychology Bulletin. 33 (5): 603–614. doi:10.1177/0146167206292689. PMID 17440210. ↑ Reicher, S; Haslam, S.A (2006). "Rethinking the psychology of tyranny: The BBC prison study". British Journal of Social Psychology. 45 (1): 1–40. doi:10.1348/014466605X48998. Wikimedia Commons has media related to Social psychology (psychology).